A visually-striking and thought-provoking resource to support Visual Arts for the IB diploma. 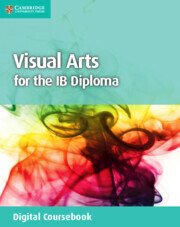 Visual Arts for IB Diploma is a student-friendly resource tailored to the IB subject guide for first exam 2016. The Cambridge Elevate edition of the coursebook covers each of the core areas of the course and links them to theoretical, art making and curatorial practices. It is a fully customisable and interactive digital learning resource, allowing students and teachers to annotate text, add audio notes and link out to external resources. Hosted on the Cambridge Elevate platform. Examples of students’ work help learners with the assessment requirements. International case studies link students' learning to real life examples from around the world. TOK questions included throughout to encourage students to make links between Visual Arts and Theory of Knowledge. Key terms and their definitions included to support students where English is not their first language. Cambridge Elevate editions are customisable and interactive, allowing students and teachers to annotate text, add audio notes and link out to external resources. Available via the Cambridge Elevate platform. 11. The IB Visual Arts DP assessment.